Look carefully. Are his lips moving? Now they’re well into the second stage. And by next spring, at most by next summer, at current enrichment rates, they will have finished the medium enrichment and move on to the final stage. From there, it’s only a few months, possibly a few weeks, before they get enough enriched uranium for the first bomb. So Netanyahu described a step that the Mossad described Iran as not even ready to start and turned it into something Iran was eager to accomplish in a few weeks. Simply put, that is a lie. It should also be noted that those two years have elapsed and the reactor still has not been powered up. Further, there are proposals that the reactor can be modified to make it produce a dramatically lower amount of plutonium. These documents have been released with very important timing. 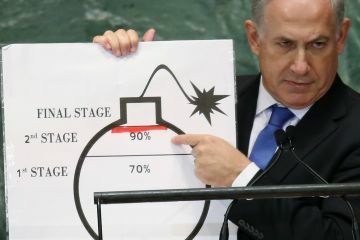 As I noted last week, Netanyahu aims to destroy the P5+1 negotiations with Iran. By pointing out his lies two years ago, we should be in a better position to see through whatever obfuscation he delivers next week. But with a new air of bipartisany-ness, to his visit, don’t look for Washington politicians to be the ones to point out his next round of lies. Postscript: I am significantly behind on my homework. I owe Marcy a careful reading of the technical documents from the Sterling trial and need to follow up more fully on the suggestions that false documents (including the Laptop of Death?) were planted with Iran for the IAEA to discover. Now with this new trove of documents and the looming date of Netanyahu’s visit, I need to get busy (on something other than planting blueberries)! Reaction to the leaked IAEA report on Iran’s nuclear technology continues. In a remarkable article in the New York Times that reads more like an Op-Ed (h/t MadDog), we see the writer urging the US to join the more militant posturing coming from . . .France. [It appears that the world has now completely inverted from the days of Freedom Fries in 2003.] 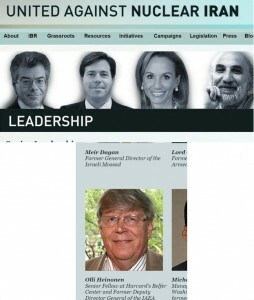 In addition, the New York Times has joined in repeating the whispers that some sort of Mossad-MEK operation was involved in the blast in Iran that killed the head of their missile development program. Also, Iran is discussing changing the extent to which it cooperates with the IAEA. International intrigue surrounding Iran also is enhanced with conflicting reports on the cause of death of Ahmed Rezaei in Dubai. Rezaei is the son of Mohsen Rezaei, who previously served as head of the Revolutionary Guards, ran for President of Iran and now heads the Expediency Council. Dubai has termed the death a suicide but most Iranian sources are labeling it suspicious. If the Obama administration wants to lead from behind in imposing sanctions to halt Iran’s nuclear weapon drive, it shouldn’t look for France to play the convenient associate. That’s not the way the French would describe their role in the world. Rather, the fact is that France, in many respects, led the United States into battle in Libya and provided much of the willpower leading to a victory over the Qaddafi regime that is shared by the Americans, British and others.